First in a series. As a food and music writer this is my way of combining both interests: after checking out concerts I’m going to review, I’ll take bands to choice places serving interesting fare past normal hours. Video footage will complement both angles. 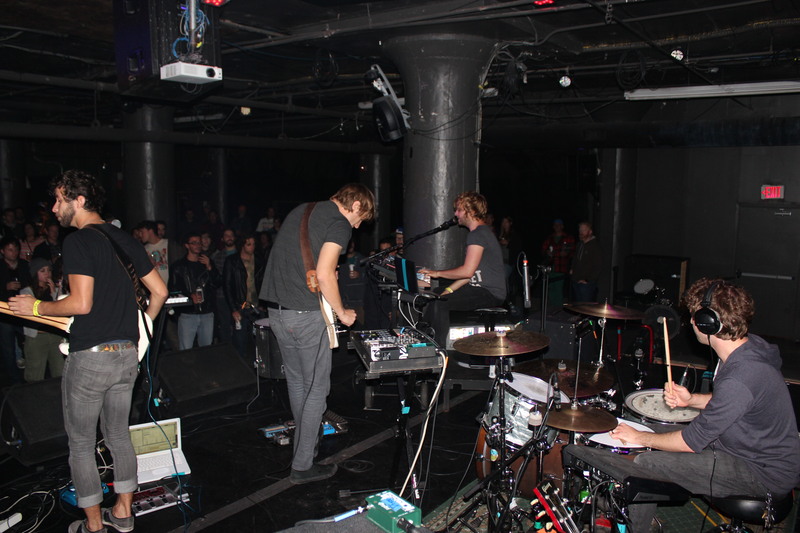 I first encountered Enemy Planes during the 2012 CMJ Music Marathon in NYC. This 5 piece from Minneapolis, who ably drift from expansive atmospherics to percussive, synth backed rushes marked by as much reverb as some of their vocals, were by far the best band I saw then. On this night, they turned the catacomb-like Underground Arts into an intimate echo chamber while ably opening for The Meat Puppets on the strength of their debut album, Beta Lowdown, which they put out in the spring of 2013. Casey Call, Joe Gamble, David LeDuc, and Shon Troth. Photo by Big Exclusive. Innervating the room, they launch their set with a livewire urgency via “Bare Your Teeth”, a track carried along by a drum pulse dotted with slick stutters, the momentum of the jazz rhythm never faltering as drummer Joe Call added deft inflections, his kit work on this track reminiscent of the opening moments of Radiohead’s “15 Step”—a fair comparison since Enemy Plane’s raucous outbursts are frequently led by percussion reminiscent of the haus-laden In Rainbows. The vocals quickly deliver a sly wink. “Tell me what you want from me, just look me in the eyes…our energies collide,” says front man Casey Call, his voice smoothly wavering from behind the piano, his ethereal takeoff extending the word eyes on a chorus alternatively supported by an echo effect, and then, a quick, delicate melody by guitarist Joe Gamble. This expert insertion of disparate elements—echo and electronic effects easily at home in ambient electronica, or, turned up further in post-industrial music—is right at home with the jazz ethos of fluency between an array of disparate parts that never gets derailed.